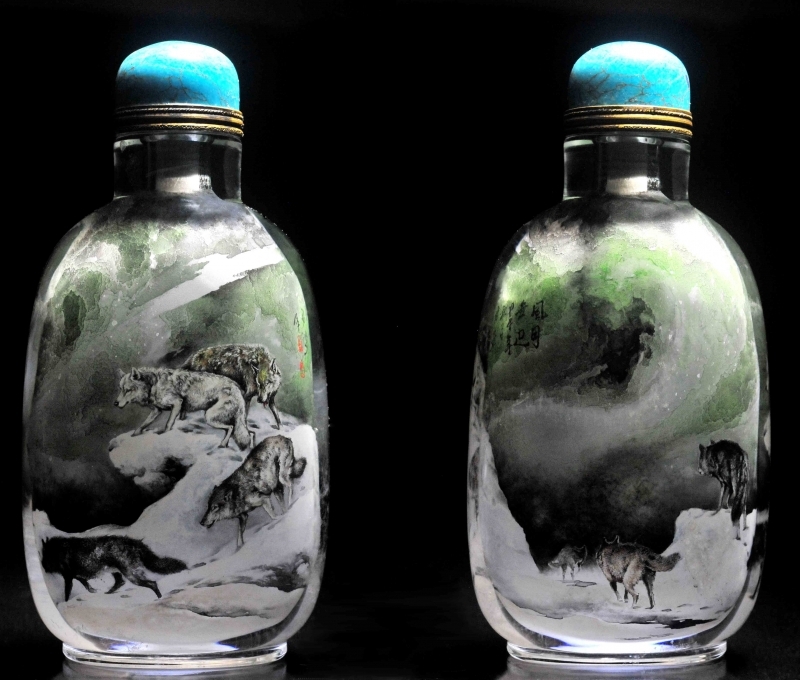 Master Lu Jun Hua uses this bigger than normal, perfectly clear, top grade rock crystal bottle to paint one of his favored animal subject; a pack of wolves. 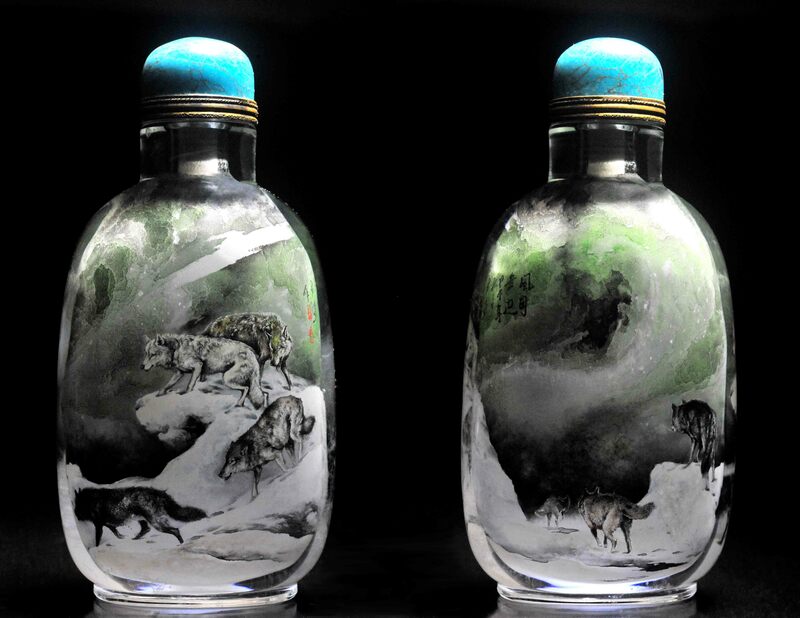 The bottle is titled “The moon and the howling wind” (风月无边) and show a pack of wolves on the prowl for their next kill in the cold winter night with howling wind and a jungle brightly illuminated by the moon. Master Lu Jun Hua uses thin swirling layers of green, black, grey and white to bring out the wind and snow that is blowing across the forest ground with silhouette of pine trees that can be vaguely made up under the light of the moon. Master Lu Jun Hua then carefully and in great detail painted the pack of wolves moving into the pine wood jungle in search of their next meal. 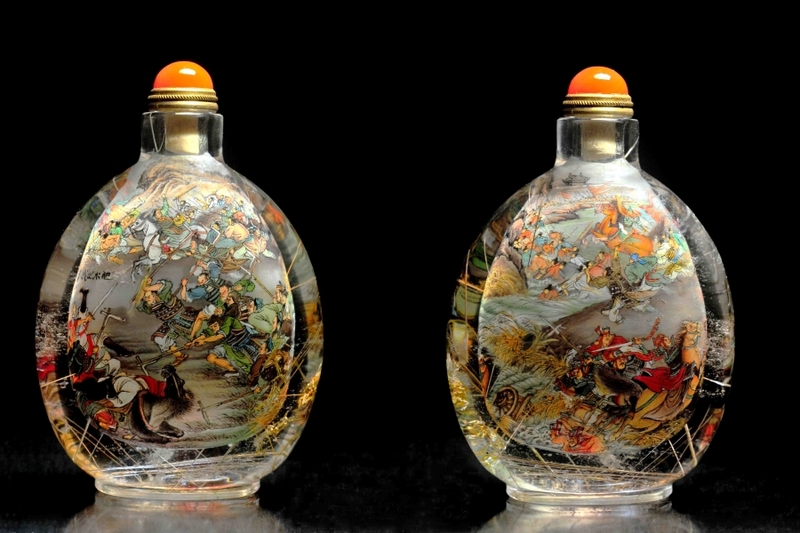 A carefully painted bottle that brings out the fine detail of the animal and their hunting behavior. 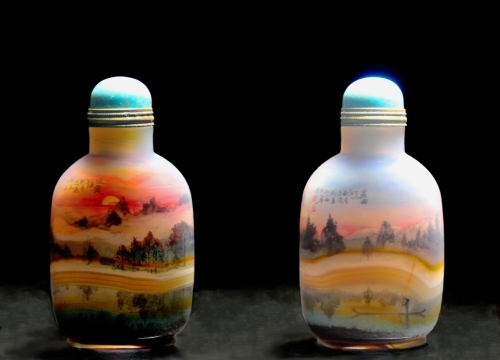 This bottle is painted by Master Lu Jun Hua on a translucent rock crystal bottle. 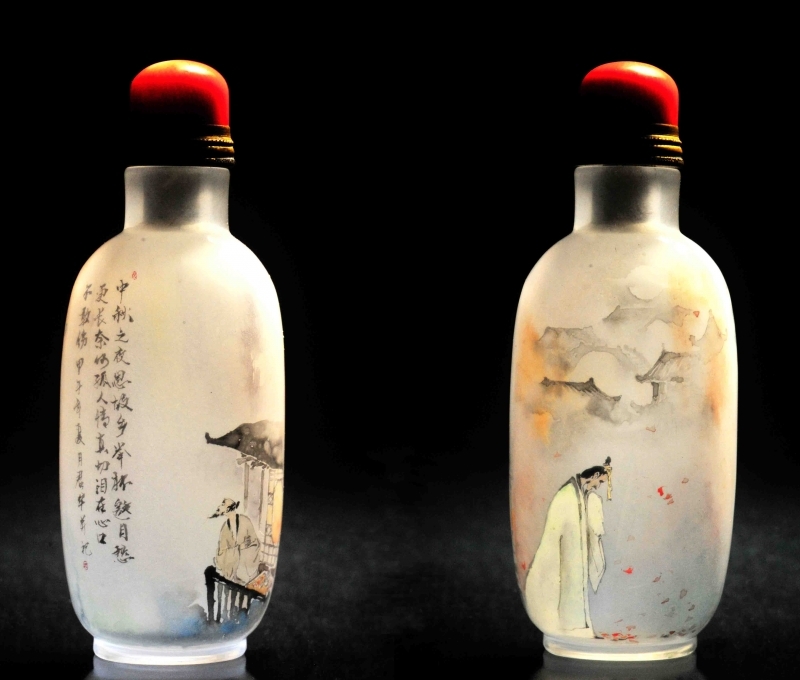 The portrait depicted on the bottle is that of the last emperor of the Tang Dynasty, Li Yu (李煜). Li Yu is more of a scholar than an emperor, he is very proud of his own artistic ability to paint and compose poem and show little interest in governing the country. Li Yu is also a firm believer of Buddhism and was more interested to build temple than fortified his city and town against the oncoming Song army. It was believed that Li Yu was still in a temple listen and studying Buddha teaching with an abbot when the Song army arrived at the foot of his capital. Although Li Yu failed miserable as ruler, he is considered as one of the most influential poet in Chinese history. 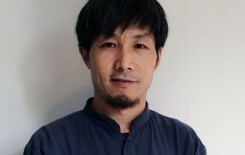 Li Yu’s poem is distinctively different from most Chinese poet, his choice of words are often simple but yet able to express his emotion across effectively. It is widely believed that Li Yu was poisoned to death by Song Tai Chong (宋太宗 - 趙光義) after he wrote one of this most famous poem, Yi Mei Ren (虞美人) that openly expresses his feeling and his pain of losing the country to the Song Army. 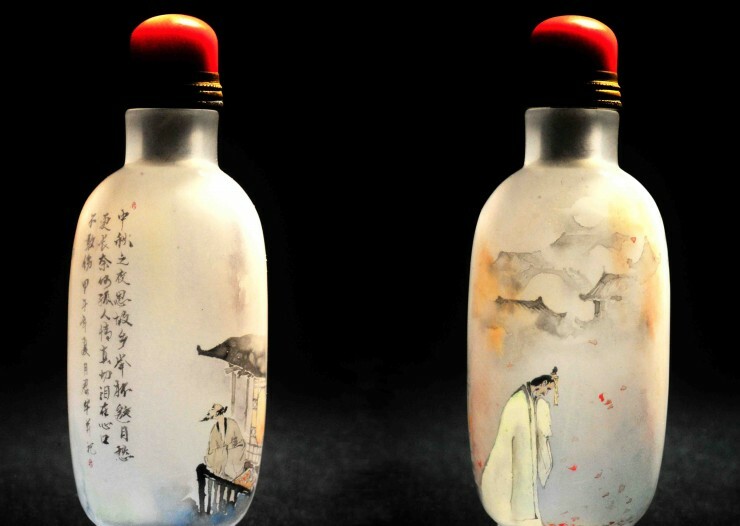 Master Lu Jun Hua skillfully painted both side of the bottle that expresses the loneliness and sadness of Li Yu after the fall of his empire. 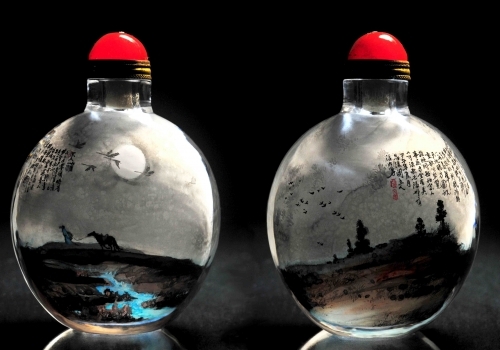 The bottle is sparingly painted so as convey the emotional states of Li Yu and, at the same time, allow spaces for the audiences to fill in their own personal feeling into this masterpiece. This bottle is painted by Master Lou Shan and is titled Que Fu (屈赋). 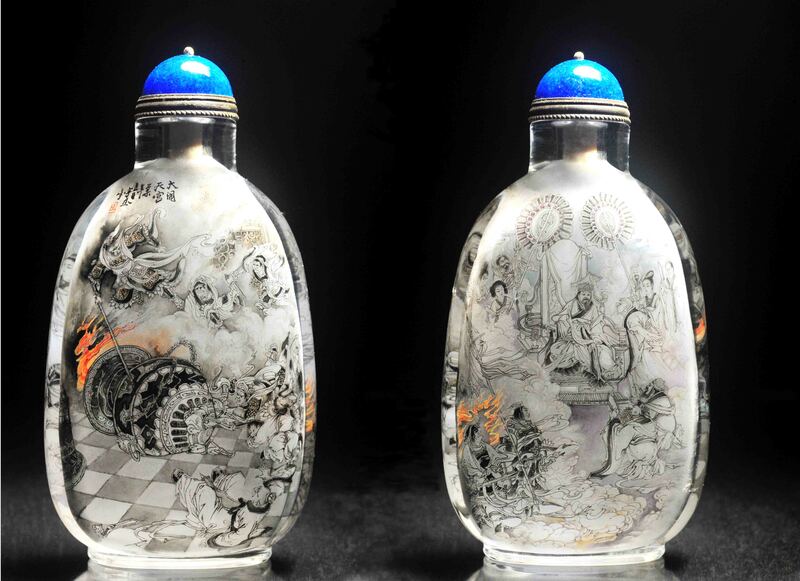 The bottle measured 8 inches tall and is carved out from a single large block of golden rutilated quartz. The bottle is painted in monochrome and in a continuous fashion without a break from any sides of the bottle. 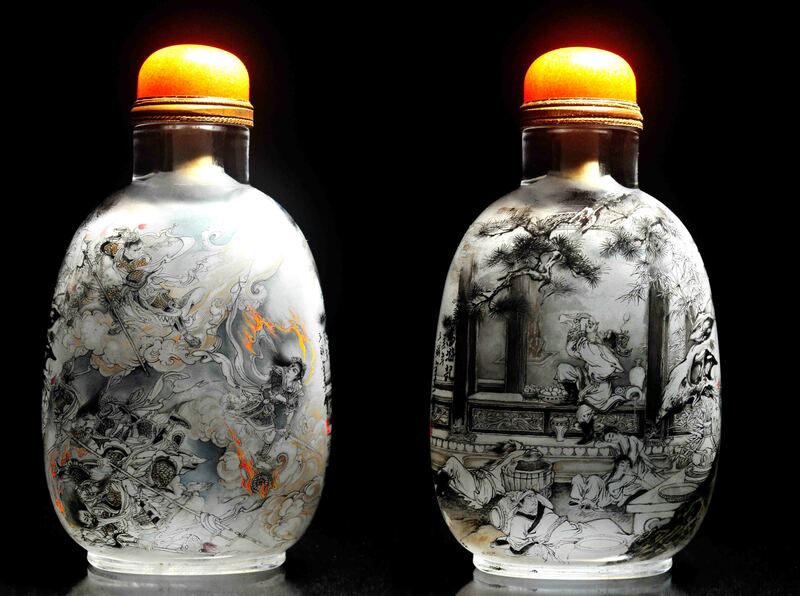 Master Lou Shan spend close to 2 months, solely on this bottle, to complete it as one of his masterpiece. Qu Yue (BC 340-278) (屈原) is one of the most famous patriotic poet in Chinese history. He was born in a noble family in the state of Chu (楚国) during the Warrior Period and attain a very high political status as the governor of internal and foreign affair of the state of Chu. 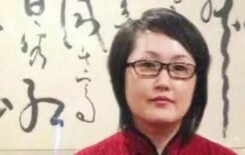 Qu Yue favors meritocracy and lobby for a fair, equal and justice legal system as oppose to absolute power given to noble families. He also favor a coalition power among the smaller and weaker states so as to form a counterbalance to the ever increasing threat from the state of Qin (秦). Needless to say, Qu Yue was not a favor among other noble families and was banished into exile to the Yuan Xiang area (沅湘流域). The state of Chu was eliminated by Qin in 278BC when the famous Qin General Bai Qi attacked the state weaken by internal corruption. Qu Yue was overcome by grieve for losing his country and seeing his countryman suffered under the rule of the Qin. 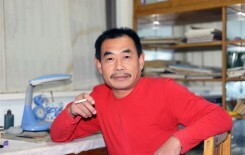 He finally decided to end his life by drowning himself in the MiLuo River (汩罗江). The much celebrated Dragon Boat festival (端午节) in present day is the memorial day of Qu Yue and is believed to be the day when he drown himself. Que Fu (屈赋) or QueYuan (屈原) Rhapsody is a collection of his poem, verse and recitation; mostly done during his exile in the Yuan Xiang area, that descript the inner feeling of Que Yuan through the different stages of his political life till his death upon the fall of the State of Chu. The Rhapsody expresses his love for his country and fellow countrymen, his political ambitions and ideology, his pain of losing his country to Qinandalso documented a lot of ancient ceremonial ritual that was performed by the native people that lived in the Yuan Xiang area (沅湘流域). Chu Ci (楚辞)or the songs of Chu is a collection of ancient poetry that contain mainly the work of Qu Yuan (屈原). Chu Ci is also commonly referred to as the style of writing originated by Qu Yuan during the Warring States in China. 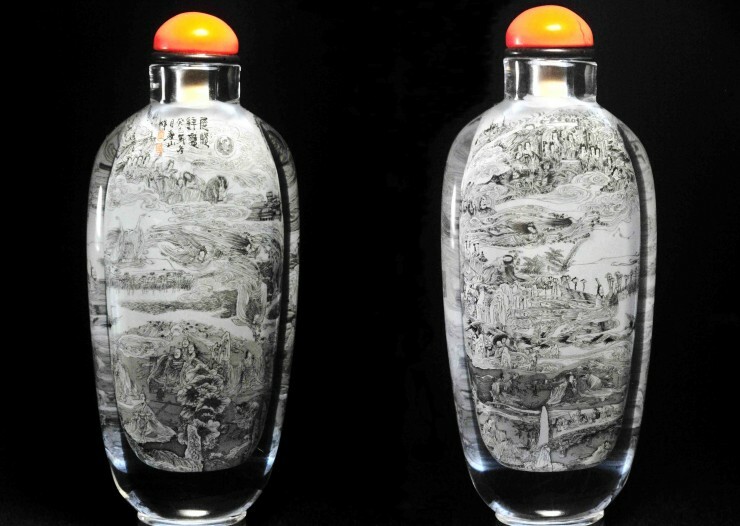 This bottle painted by Master Luo Shan on a clear rock crystal bottle depict a famous Chu Ci rhapsody call Jiu Ge (九歌), or Nine Songs. The rhapsody consists of 11 verses, despite the "Nine" in the title. Out of the 11 verses, nine verses are dedicated to gods and deities, one to the spirits of fallen warriors who died fighting far from home, and a final concluding verse. The reason for the discrepancy between the 9 verses referred to in the title and the fact that there are actually 11 is uncertain, although an important question. Jiu Ge (九歌) seems to originate from some shamanistic dramatic practices of the YangZi River valley area involving the invocation of divine beings and seeking their blessings by means of a process of courtship. 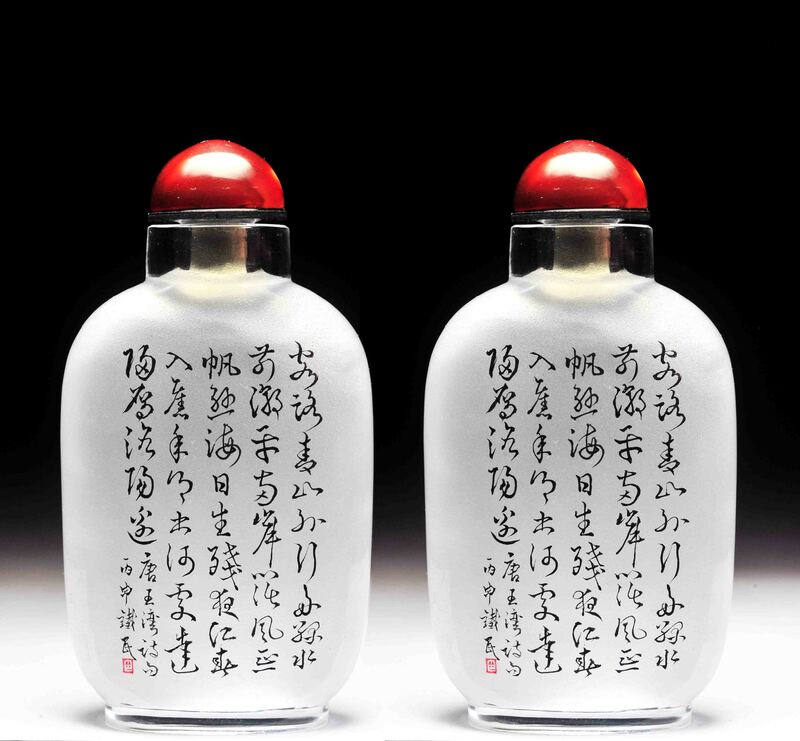 Other than the first and last verse, Dong Huang Tai Yi(东皇太一); The Eastern Emperor Tai Yi and Li Hun(礼魂); Rite for Spirits, which both are solemn songs for welcoming and sending off of gods and spirits, the rest of the rhapsody is refreshingly light and graceful. 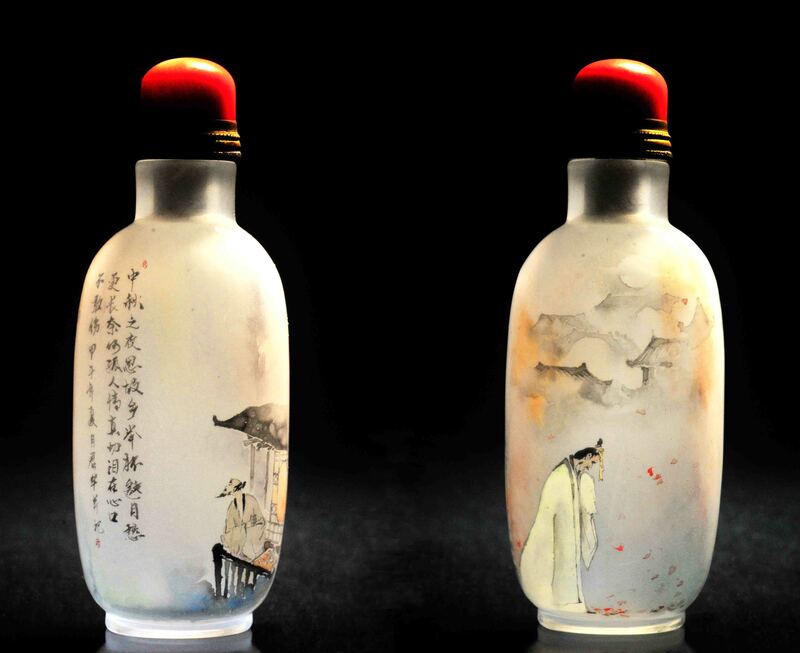 Master Luo Shan has created a bottle filled with the mystical energy of Heaven and Hell with Qu Yuan as the central figure orchestrating the dances of fairies, dragon and the spirit from the underworld. A very captivating, energetic and colorful bottle that show off Master Luo Shan painting capabilities and artistic creativity. The Battle of Fei Shui (肥水之戰) happened in AD383 at the North of Dong Ji River near the present city of He Fei (合肥市) in Eastern China. The battle of Fei Shui was documented as one of the most famous battle in ancient China whereby the mighty invading army of the Qian Qin (前秦), totaling to more than 800 thousand in numbers was defeated by a defending forces of the Dong Jin (东晋) Army who had only 80 thousand soldiers in strength. The outcome of the Battle of Fei Shui has huge influence over the economic and cultural development of China as peace was restored for the next 40 years for the area south of the Huang River. The battle also significantly weaken the Northern Nomadic tribes and throw them into disarray; denying them the military ability to invade the South for many decades. 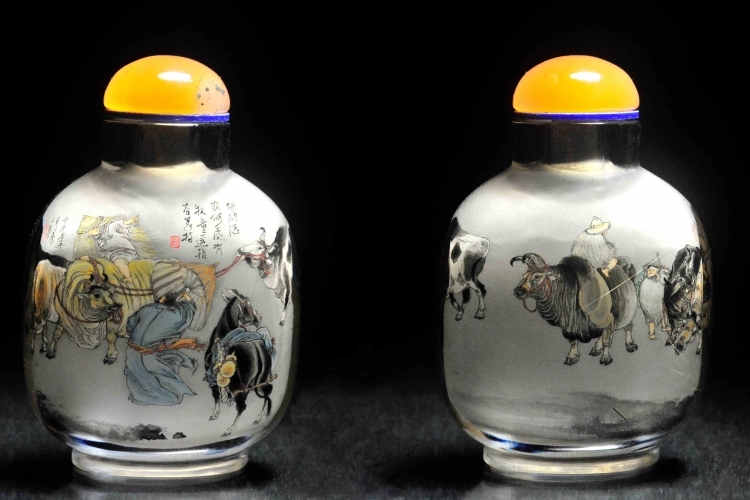 It is believed that the stable development in Chinese culture, made possible during this peaceful regime, is the cradle of the golden age of Chinese Culture during the Sui, Tang and Song dynasty. This natural rutilated crystal bottle was painted by Master Lou Shan (娄山). It depicts the final decisive moment during the Battle of Fei Shui whereby the Dong Jin Army defeated the Qian Qin forces and send them fleeing back to the North. 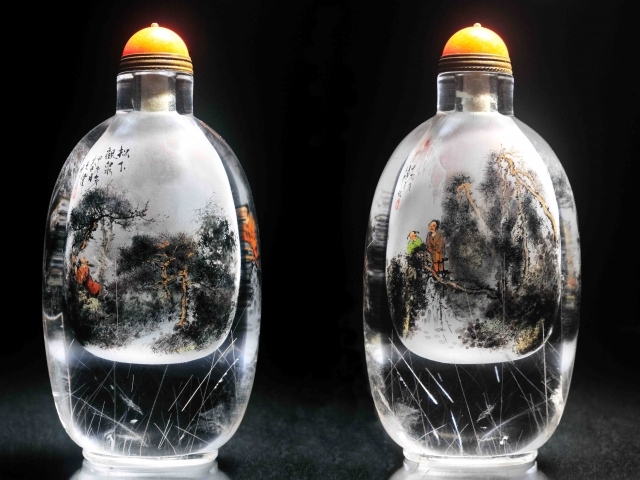 This rock crystal bottle was painted by Master Zhang YaHong (张亚红) and titled The Passerby that remains in my heart (风尘过客). Master Zhang YaHong uses dull tones of black and grey to depict the sadness and loneliness of a lady that is waiting hopelessly for her lover to return to her side. Time passes quickly and her attractive look soon withered away like the flowers in the off season; leaving behind only loneliness and the memories of the good time that cannot be easily forgotten. 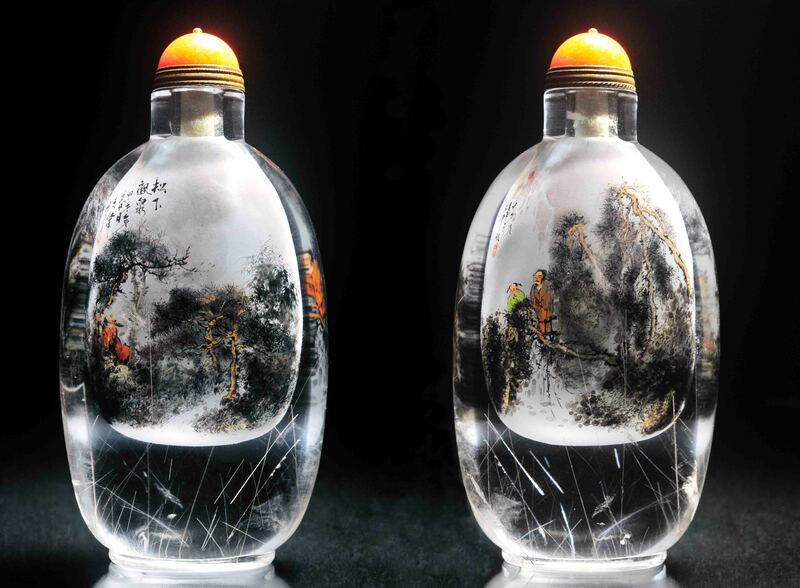 Zhang YaHong also cleverly uses splashes of bright yellow and white to paint flowers like chrysanthemum and lotus to brighten the bottle. Chrysanthemum in Chinese signify hope in true love and lotus flower signify that she has a soul that is pure and righteous, always hoping for the return of her lover. Dream of the Red Chamber (红楼梦), also called The Story of the Stone (石头记), composed by Cao Xueqin, is one of China's Four Great Classical Novels. 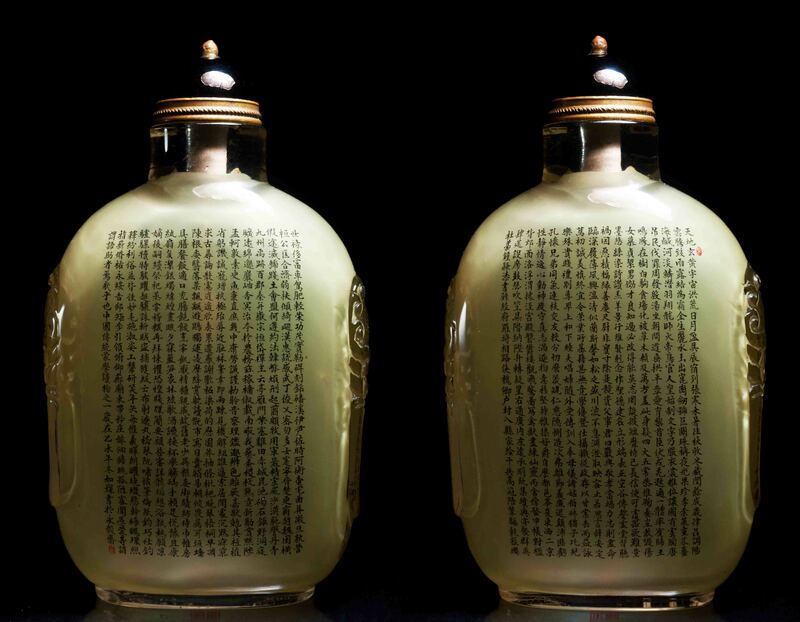 It was written sometime in the middle of the 18th century during the Qing Dynasty. It is considered a masterpiece of Chinese literature and is generally acknowledged to be the pinnacle of Chinese fiction. "Redology" is the field of study devoted exclusively to this work. Red Chamber is believed to be semi-autobiographical, mirroring the rise and decline of author Cao Xueqin's own family and, by extension, of the Qing Dynasty. As the author details in the first chapter, it is intended to be a memorial to the damsels he knew in his youth: friends, relatives and servants. The novel is remarkable not only for its huge cast of characters and psychological scope, but also for its precise and detailed observation of the life and social structures typical of 18th-century Chinese aristocracy. The novel also provides great insight in its depiction of the Chinese culture of the time, including description of the era's "manners, expectations, and consequences." 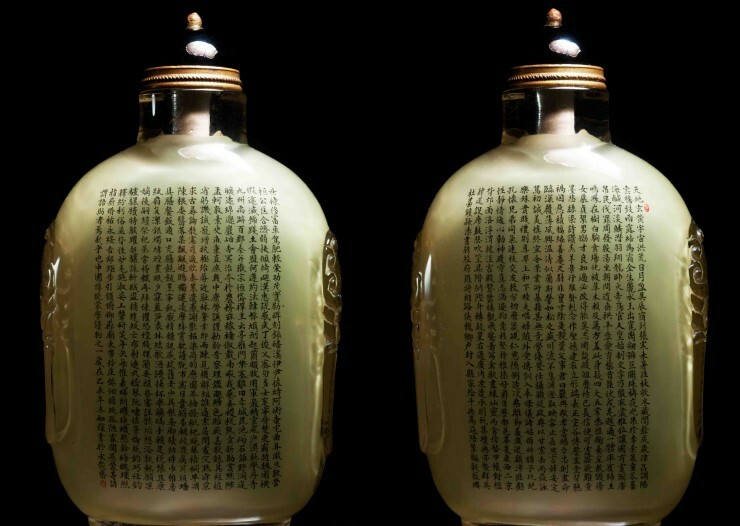 Many aspects of Chinese culture, such as medicine, cuisine, tea culture, proverbs, mythology, Confucianism, Buddhism, Taoism, filial piety, opera, music, painting, classic literature and the Four Books, are vividly portrayed. 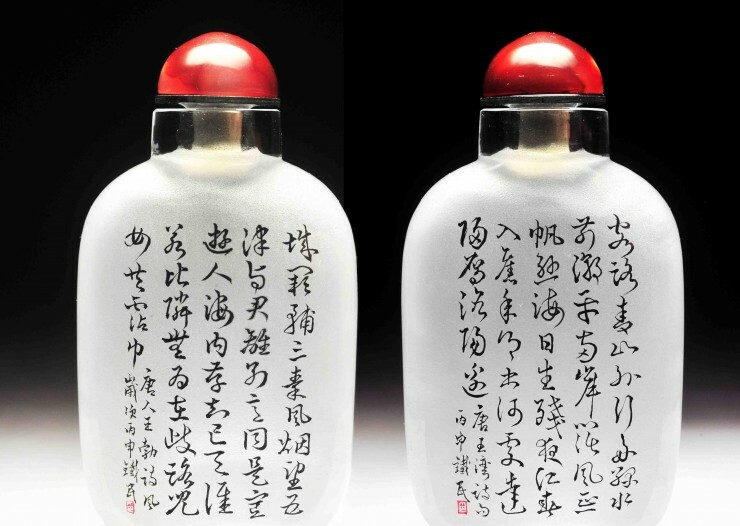 Among these, the novel is particularly notable for its grand use of poetry.This bottle is cleverly painted by master Zhang Ya Hong using an elaborated natural crystal bottle. 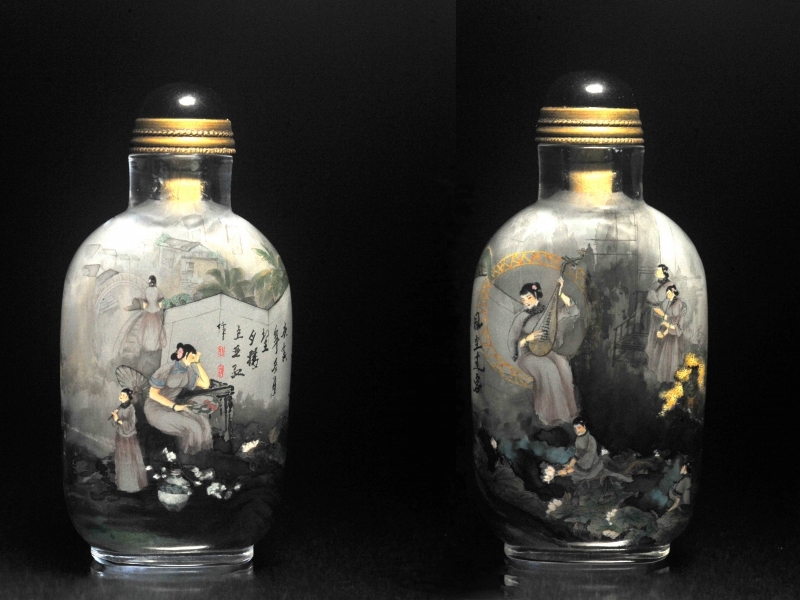 The first side of the bottle is painted with the main male character in the novel, Jia Baoyu (贾宝玉) with the Twelve Beauties of JinLing (金陵十二钗) forming a background behind BaoYu portrait. 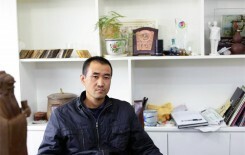 Baoyu is highly intelligent, but dislikes the fawning bureaucrats that frequent his father's house. A sensitive and compassionate individual, he has a special relationship with many of the women in the house. He cannot forget Daiyu after being tricked into marrying Baochai. 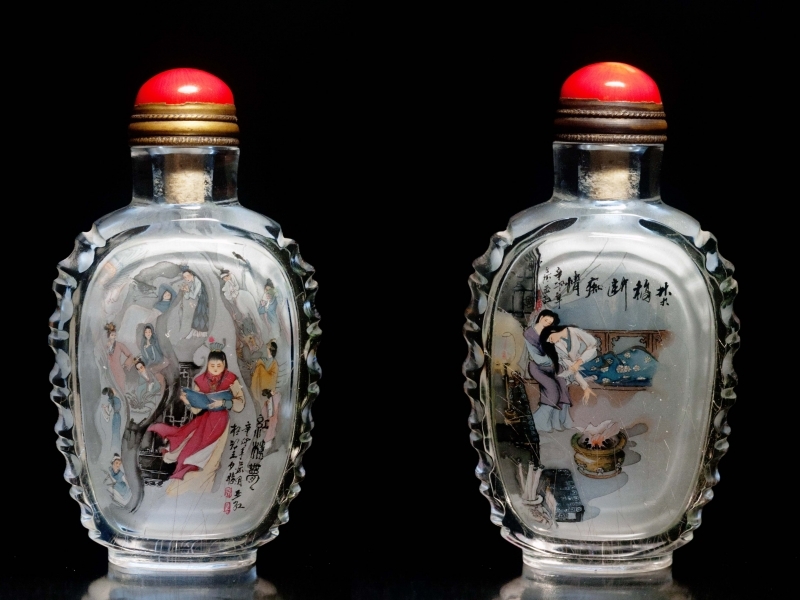 He disappears after taking the imperial examination and becomes a monk.The reverse side of the bottle depict the last moment of Lin DaiYu (林黛玉) before she dies of a broken heart after learning of the marriage of Baoyu and Baochai. Lin Daiyu is the reincarnation of a flower from the frame story, and the purpose of her mortal birth is to repay Baoyu with tears for watering her in her previous incarnation. She is fragile emotionally, prone to fits of jealousy, but nevertheless an extremely accomplished poet and musician. Lin Daiyu is probably the most famous of the Twelve Beauties of Jinling, and the novel describes her as a lonely, proud and ultimately tragic figure. The Thousand Character Classic, also known as the Thousand Words Text (千字文), is a Chinese poem used as a primer for teaching Chinese character and moral values to children from the sixth century onward. It contains exactly one thousand characters, each used only once, arranged into 250 lines of four characters apiece and grouped into four line rhyming stanzas to make it easy to memorize. Along with the Three Character Classic (三字經) and the Hundred Family Surnames (百家姓), it formed the basis of literacy training in traditional China. There are several stories of the work's origin. One says that Emperor Wu (梁武帝) of the Liang Dynasty (南朝梁) (502–549) commissioned Zhou XingSi (周兴嗣) to compose this poem for his prince to practice calligraphy. Another says that the emperor used one thousand different character written by Wang XiZhi (王羲之) a noted calligrapher, as the model for his sons to practice calligraphy. He, however, feel that this method not organized and order Zhou XingSi to make it into a poem. 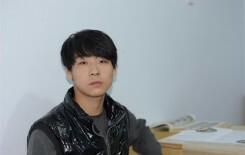 Zhou worked so intensely to finish doing so overnight that his hair turned completely white after. This classical text also has a huge influence over the Korean and Japanese culture. It is still being used as a basic literacy text for students in many countries over Asia. 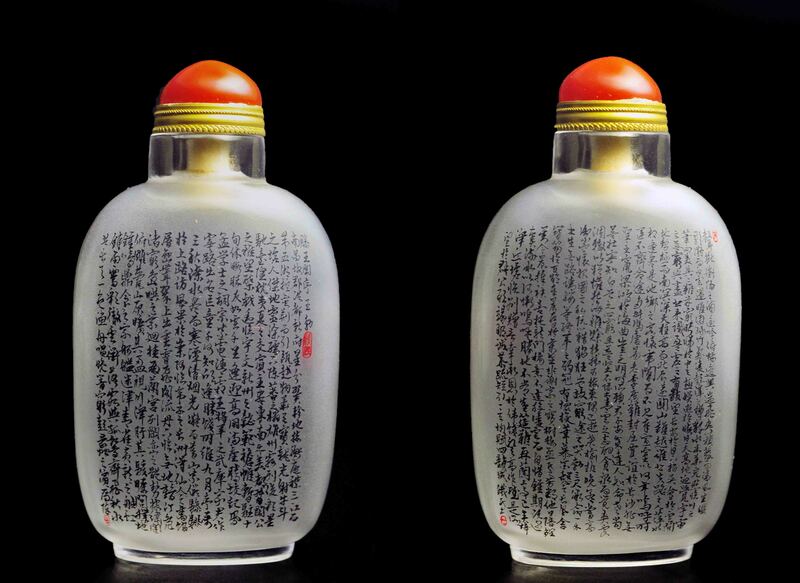 Master Lee RuChen has painted this poem over the two sides of the snuff bottle. Each character is carefully written and is only about 2mm in height. 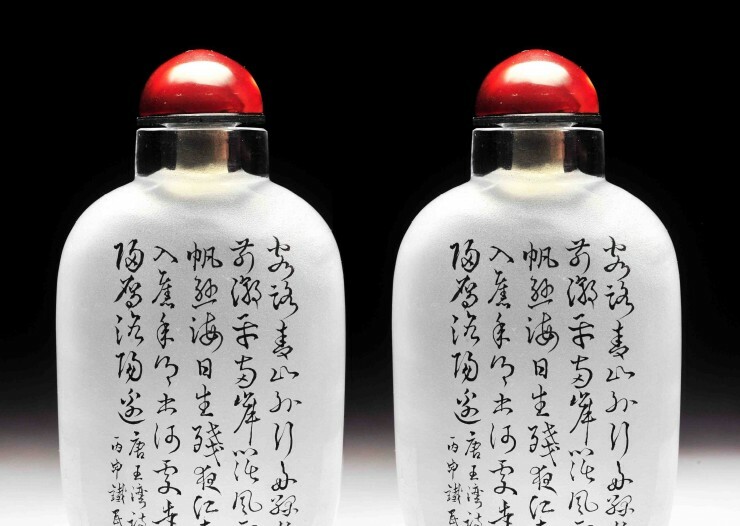 Master Lee will only produce about 2-3 of such bottles a year due to its complexity level and also the strain to her eyes. 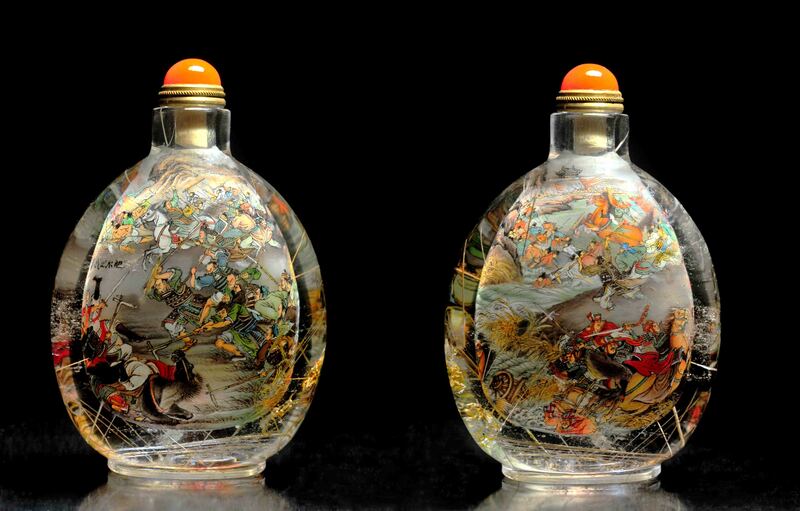 This exceptional bottles took more than 2 months to complete. Sun Wukong (孫悟空), also known as the Monkey King or the Monkey God, is the most famous character in the Chinese classical novel, Journey to the West (西游记) written by Wu ChenEn (吳承恩) in the Ming Dynasty. In the novel, Sun Wukong is a monkey with supernatural powers and he was born out of a stone that had tapped into cosmic energy since time begin. Su Wukong rebelling against the court of heaven and was being imprisoned under a mountain by Lord Buddha. To atone for his sins, he agree to accompany and become the protector of the monk Xuanzang (僧人玄奘) on his journey to the West to retrieve the secret Buddhist sutras from India. 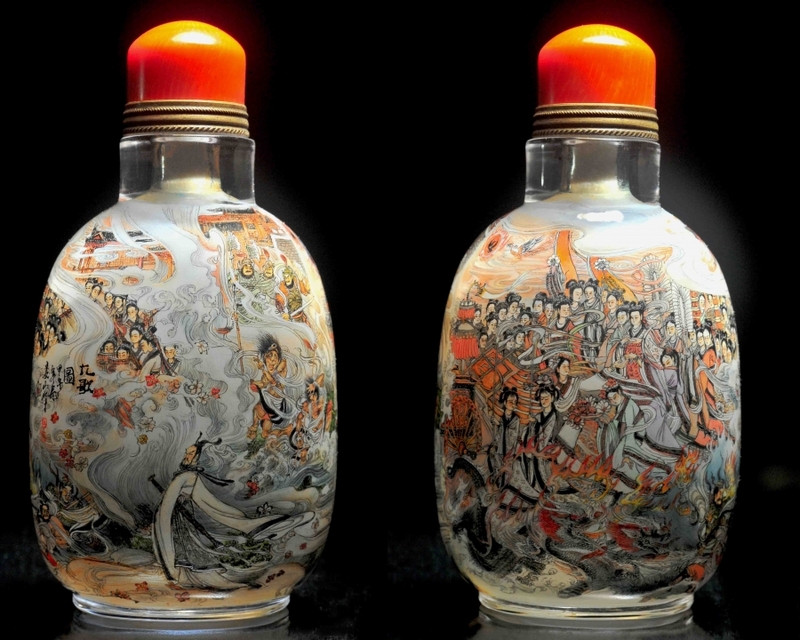 The other side of the bottle show Sun Wukong jumping out of Laozi’s BaGua Crucible after being subjected to the burning of the most severe Samadhi fire for 49 days. Sun Wukong emerged stronger than before with a pair of golden-gazed fiery eyes (火眼金睛) that have the ability to recognize evil in any form. Master Yu Jie used a monochrome style to draw out the scenes of the Monkey God battling in heaven and introduce brightly colored fire and flames in selected area to emphases on the action packed story of Sun Wukong. 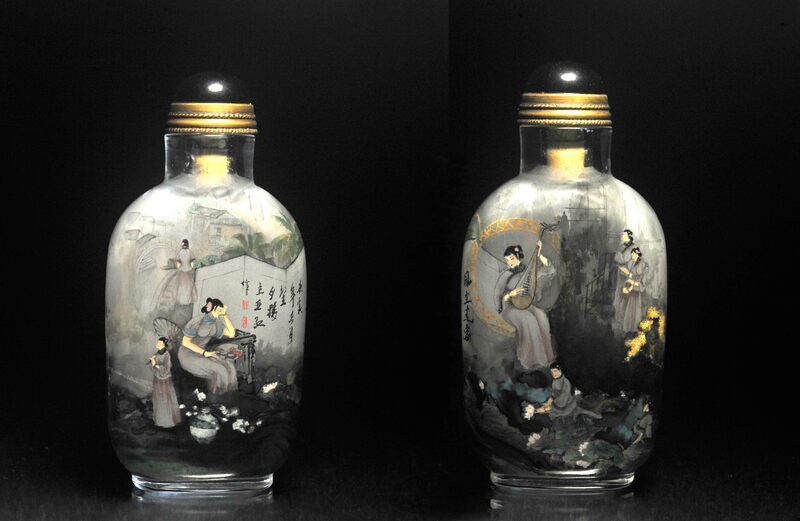 A carefully drawn bottle that has a 3D effect of the battle scene. 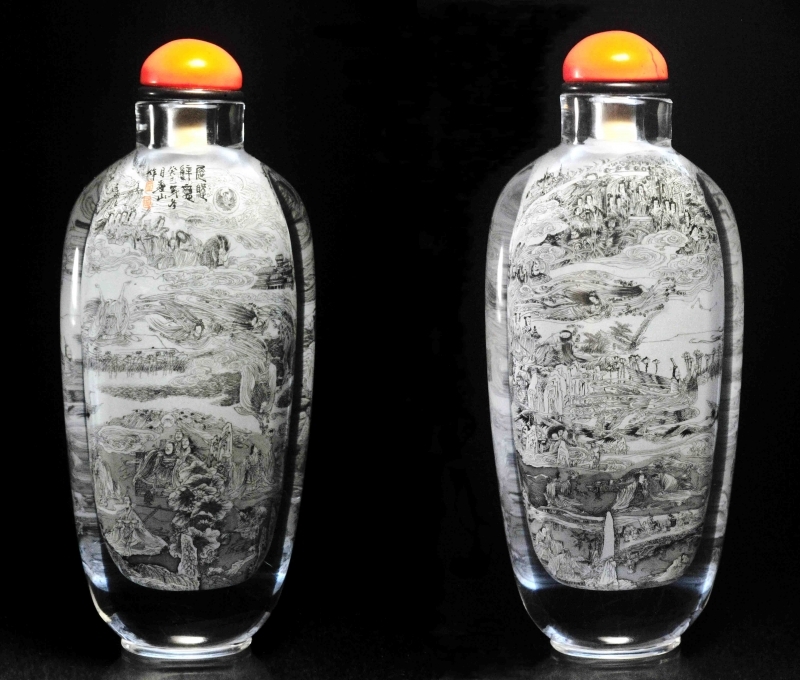 This crystal bottle was drawn by Master Yu Jie (宇杰) and show two famous scenes when Sun WuKong created havoc in heaven. 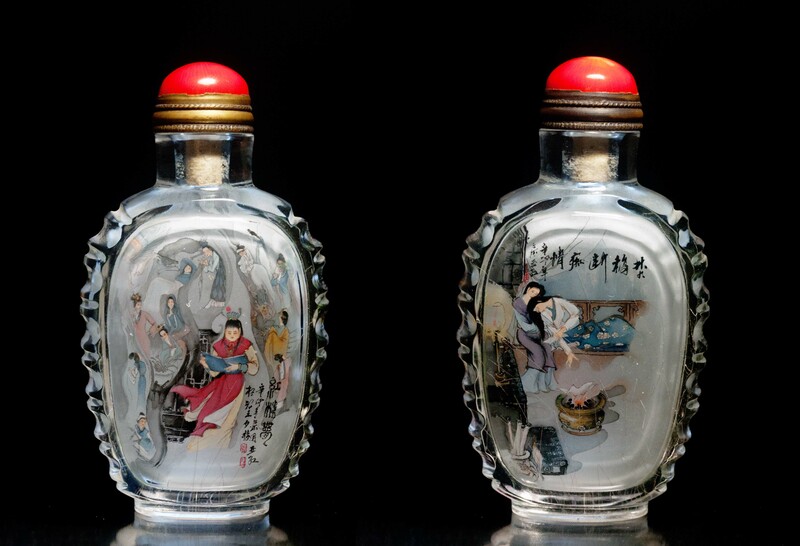 One side of the bottle show the Monkey God drinking up all of the Jade Emperor’s (玉皇大帝) royal wine before the start of the royal party; Sun Wukong found out that he was excluded from a royal banquet that included every other important god and goddess, Sun Wukong's indignation again turned to open defiance and decide to spoil the royal party to take revenge. 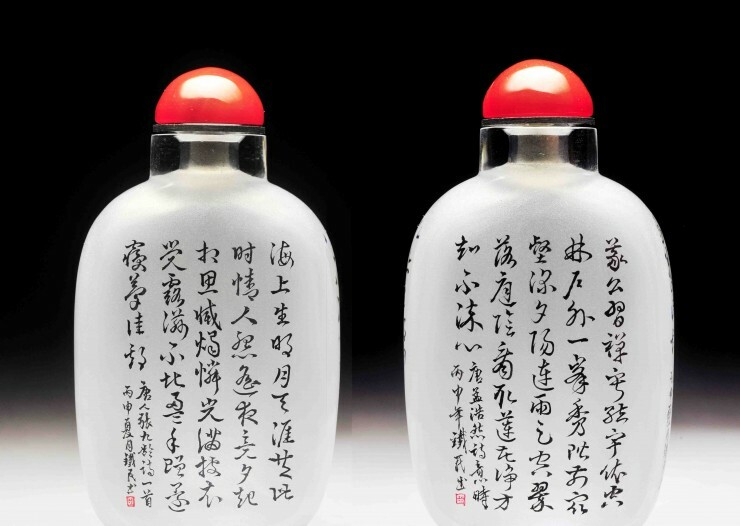 After stealing and consuming Xi Wangmu's (西王母) "peaches of immortality", Tai Shang Lao Jun (太上老君) "pills of longevity", and the Jade Emperor's royal wine, he escaped back to his monkey kingdom in preparation for a fight with the celestial warriors. 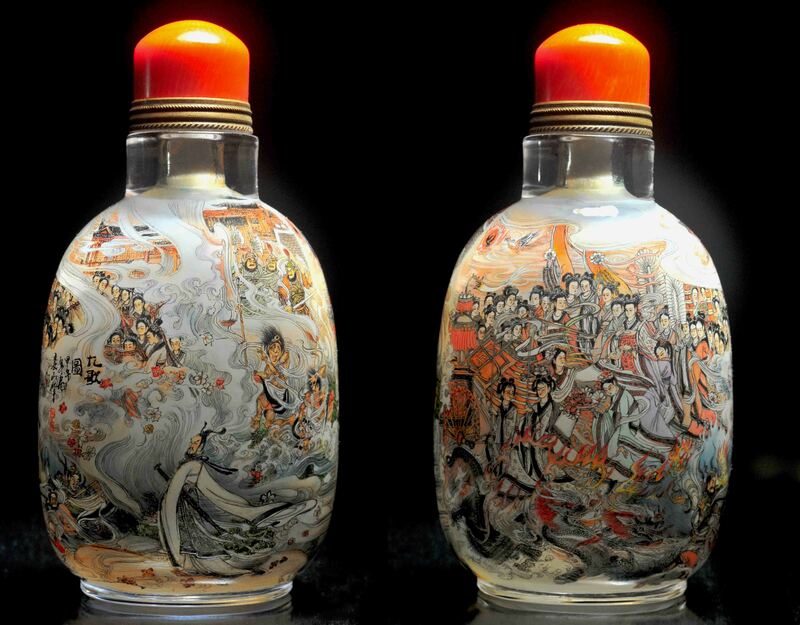 The other side of the bottle depicted Sun Wukong defeating Nezha (哪吒), the son of General Li Jing (李靖), who is as powerful as the best of Heaven's generals, Erlang Shen (二郎神). Sun Wu Kong single-handedly fought the Army of Heaven's 100,000 celestial warriors, with each fight an equivalent of a cosmic embodiment. 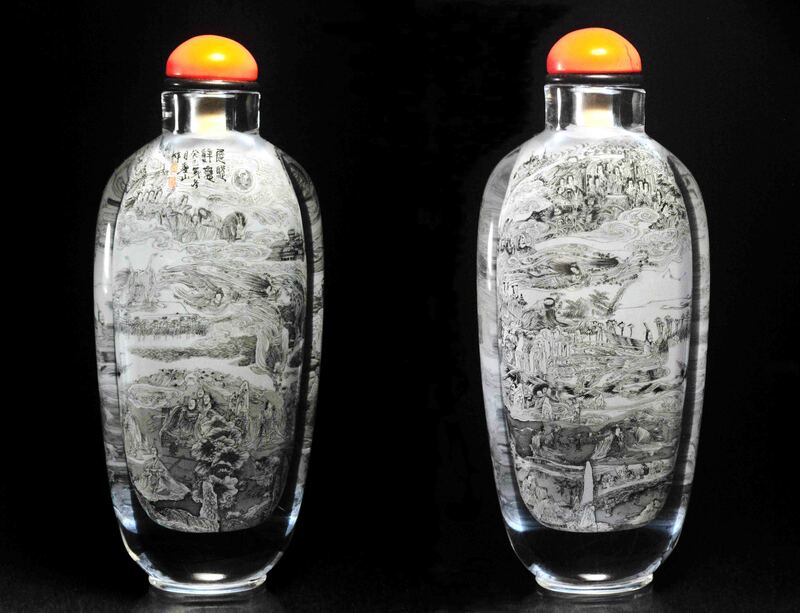 The theme painted by Master Qin Ren on this natural rock crystal bottle is a popular Tang Poem titled QingMing Festival (清明), written by the Tang poet Du Mu (杜牧). Qing Ming Festival, or Tomb Sweeping Day is the most important traditional Chinese festival session in the spring whereby the whole family will gather together and visit the ancestor’s tomb to paid respect and pray for their blessing for the coming year. Qing Ming fall on the 15th day after the Spring Equinox and as the climate is transitioning from the cold of the winter session to a warmer spring, sudden drizzle that last many hours is fairly common. On the road, the soul of the homesick and disconsolate travelers are filled will loneliness. Where can I find an Inn to drink my sorrow away? A cowherd boy points, far away, to the Apricot Blossom Village. 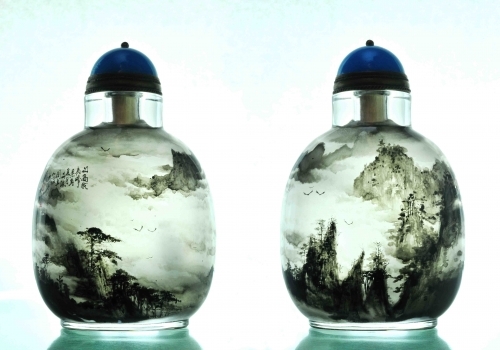 This partially hollowed rutilated crystal bottle was painted by Master Wang Wei and titled “Admiring the fountain under the pine tree “ (松下观泉); whereby a Chinese scholar is seen spending time under a pine tree, admiring the water sprouting out of the cracks in the mountain and at the same time drawing inspiration from the beauty of the surrounding landscape. 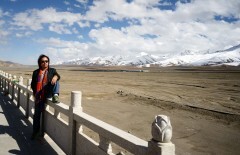 Chinese scholars like to visit or even stay in solitary in the wilderness for long period of time to be inspired by the beauty of the surrounding. 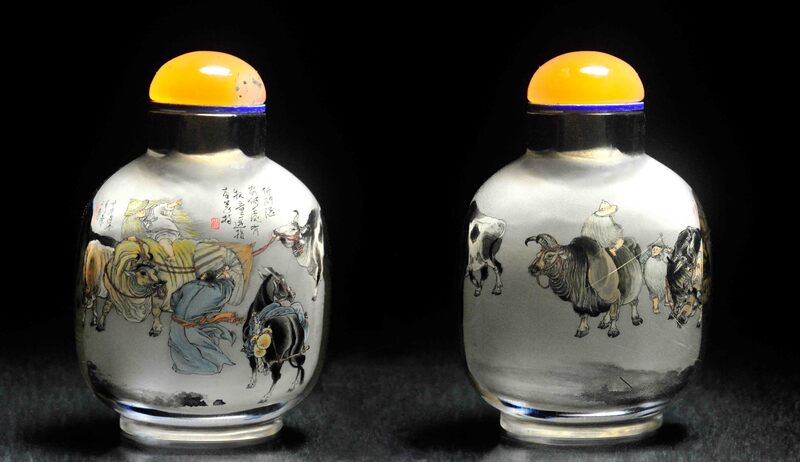 This connectivity and appreciation of nature is very often carried into Chinese work of art, poem and even Chinese philosophy. 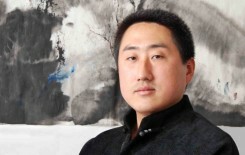 Master Wang Wei likes to paint his landscape pieces with scholastic figuring in traditional Chinese ink scroll painting technique. He uses mainly different shades of grey to carefully paint out the layers of foliage of the pine tree, bamboo and also objects in the fore and background. His figurine is always child-like or cartoonish, often wearing bright colored clothing that splashes a dash of liveliness into the overall picture. 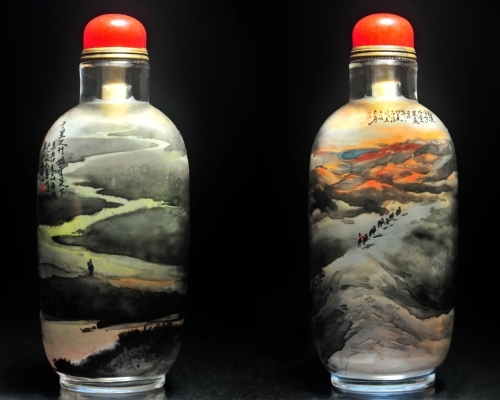 A nicely painted bottle that capture the essential of Chinese ink landscape painting. 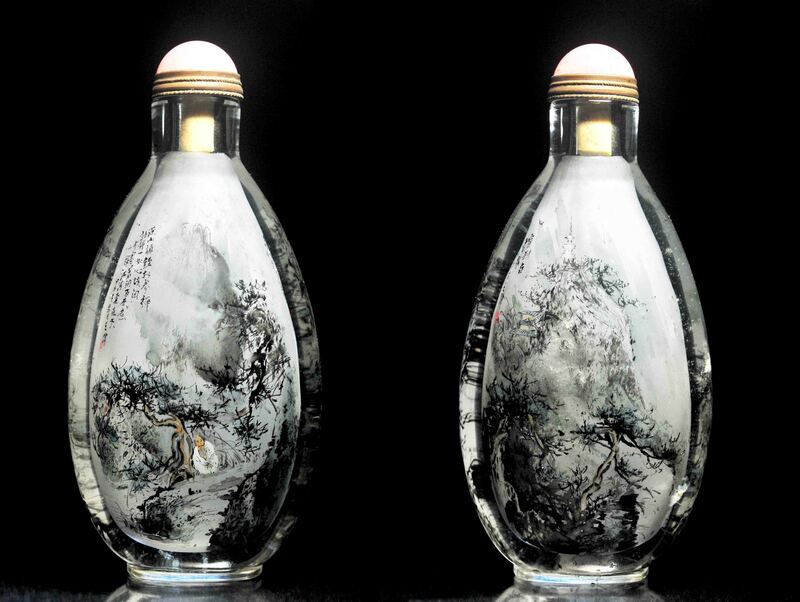 This beautiful tears shaped bottle, carved out from natural rock crystal that has slight white fluffy inclusion, was used by Master Wang Wei to create a landscape painting of a temple high up the mountain. The white fluffy inclusion was cleverly included into the painting as the falling snow that added another dimension into the almost monochrome painting. 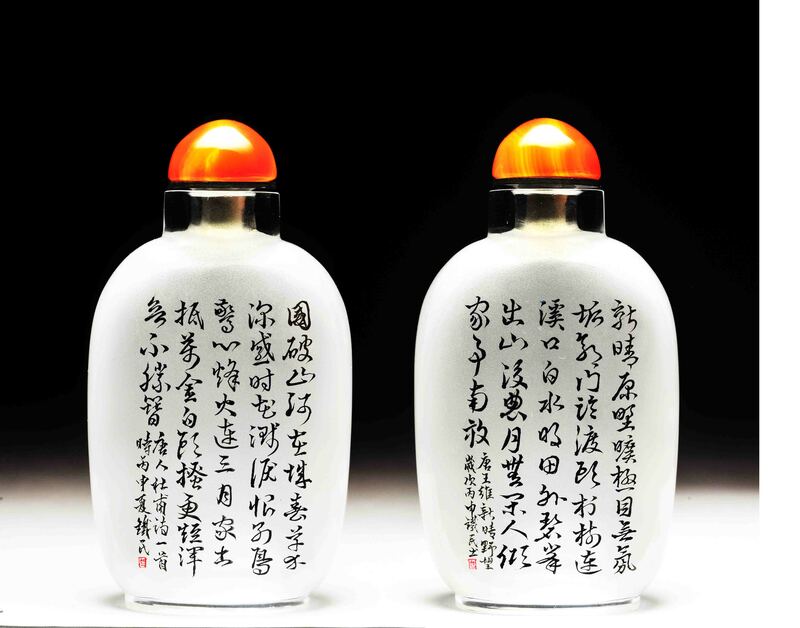 The title of the bottle is “Temple in the white cloud” (宝刹白云间). 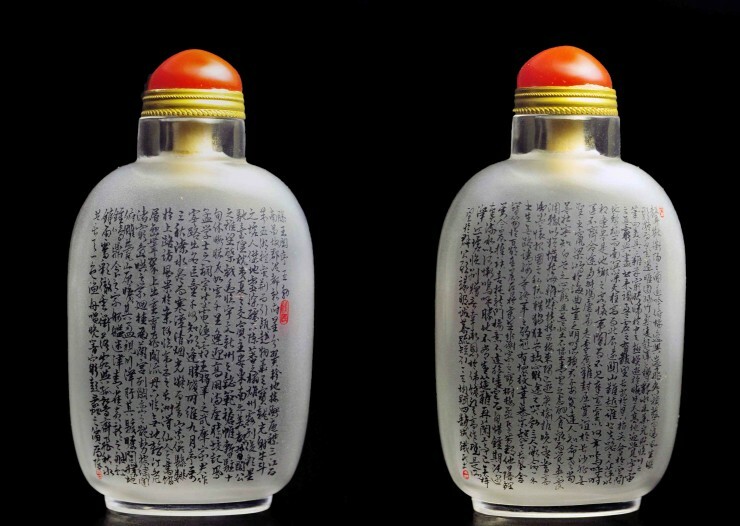 One side of the bottle describes a temple that is built high up in the mountain among the clouds and the other side, a monk mediating in the pine tree forest. 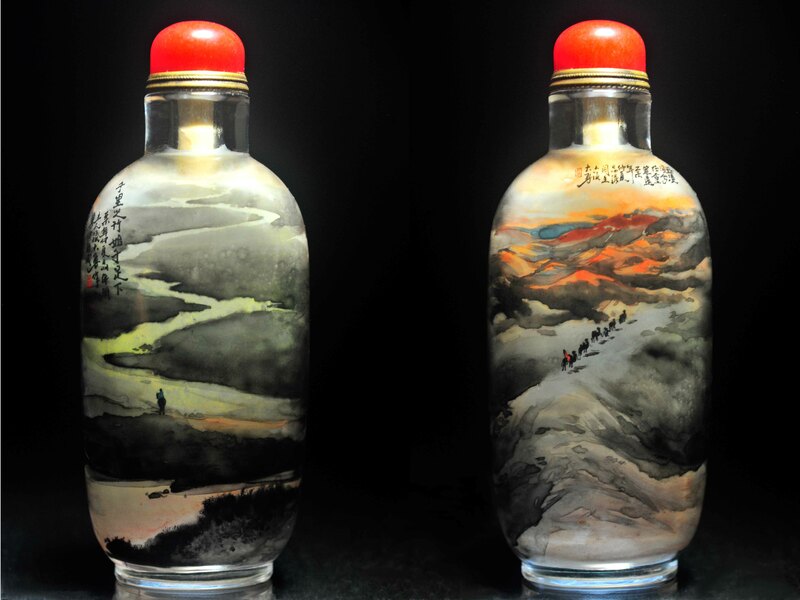 Master Wang Wei confidently painted the bottle in quick succession with short brush work that gave a lively outlook of the pine tree and its foliage. He then carefully crafted out the mountain; leaving the appropriate area blank to signify the snow on the mountain slope. The picture harmonized seamlessly with the natural white fluffy inclusion of the bottle that act as the falling snow that is floating slowly down to the ground. 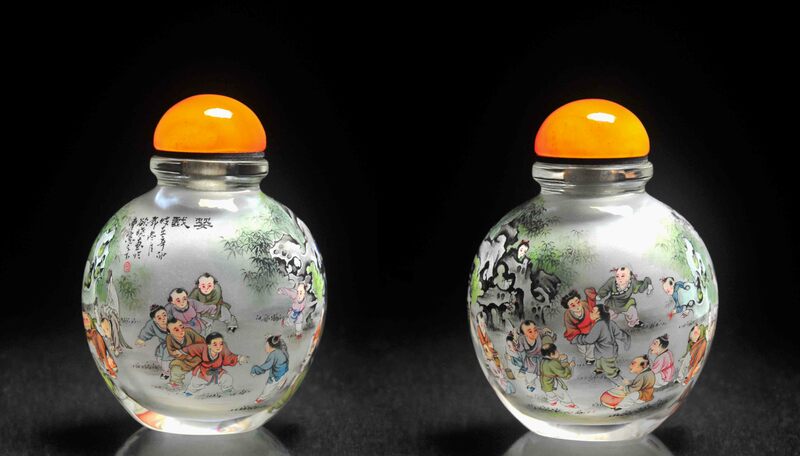 The “Picture of the Hundred Sons” is a very common congratulation theme in the Chinese culture. The number “Hundred” symbolizes plentiful and never ending. Therefore, the painting theme of the “Hundred Sons” symbolizes a prosperous family with abundant wealth and many sons to carry the family’s name and prosperity down countless generations. The theme started from as far back as Zhou Wen Wang (周文王) in BC1152 where it was said that he has 100 children. Since then, the theme of the Hundred Sons has been used as a lucky symbol for Chinese till now. 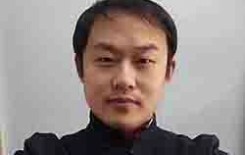 Master Zhang Xiao Yu is well known for painting “Picture of the Hundred Sons”. 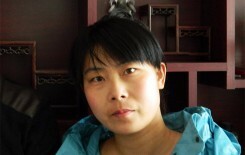 Her work has been commemorated by Master Wang Xi San as outstanding and capture the essence of this well-known theme. 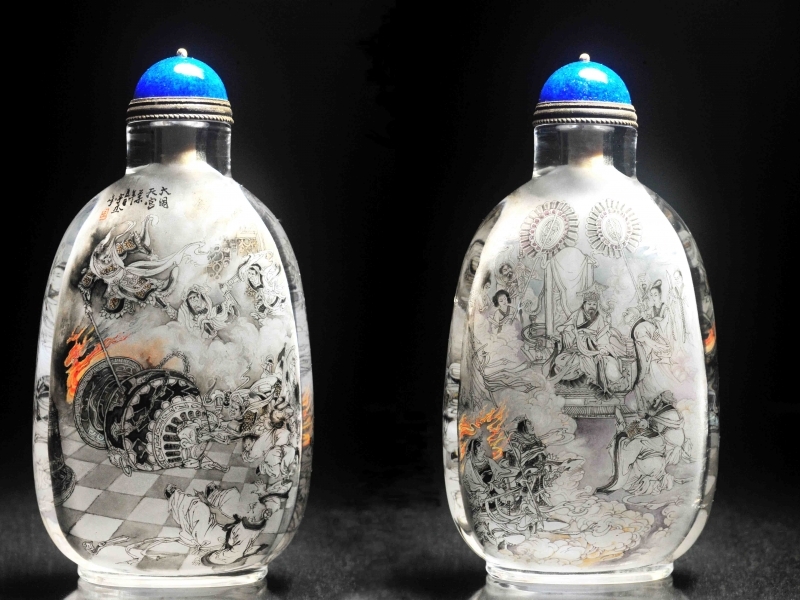 This piece is drawn in a small natural crystal bottle of only 4.8cm in height. However, one can see the fantastic details of the children at play down to the different expression on the faces of each child. An excellent example of Zhang Xiao Yu mastery in painting the “Picture of the Hundred Sons”. Tengwang Pavilion, one of the Four Great Towers of China*, is located in the northwest quadrant of the city of Nanchang (formerly Hongzhou), in Jiangxi Province. The towering pavilion is situated on the east bank of the Gan River, which empties into the Yangtze River via China's largest freshwater lake, Lake Poyang, about 40 kilometers north of Nanchang. The pavilion was built in CE 653 during the fourth year of the Yonghui (CE 650-655) Reign of Emperor Taizong of the Tang (CE 618-907) Dynasty for the emperor's younger brother, Prince Teng Li Yuanying (sometimes called King ("Wang") Teng, hence the name of the pavilion). Tengwang Pavilion was so distinctive in its architectural style that it, together with the much older (CE 223, circa) Yellow Crane Pavilion of the Three Kingdoms (CE 220-280) Period, was imitated by the architect of the Forbidden City, who used the pavilions as models for the corner towers of the Forbidden City complex (the Forbidden City was constructed in the years CE 1406-1420, i.e., during the Ming (CE 1368-1644) Dynasty). Tengwang Pavilion was constructed while Prince Teng served as the provincial governor of Nanchang. Almost immediately after its construction, the pavilion was immortalized, as it were, in a poem by the famous Tang Dynasty poet, Wang Bo, who, in CE 675, wrote the classic, Tengwang Ge Xu "Preface to Prince Teng's Pavilion". 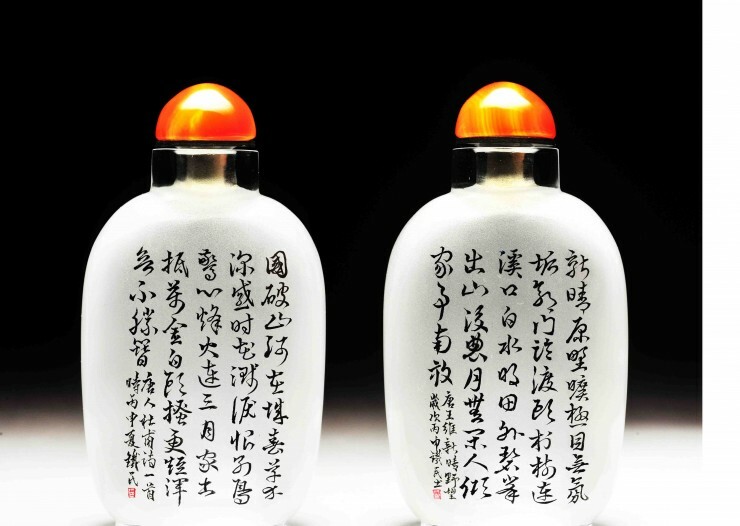 The text on Tie Ming bottle is the whole script of Preface to Teng Wang Pavillion which consists of a total of 773 words.